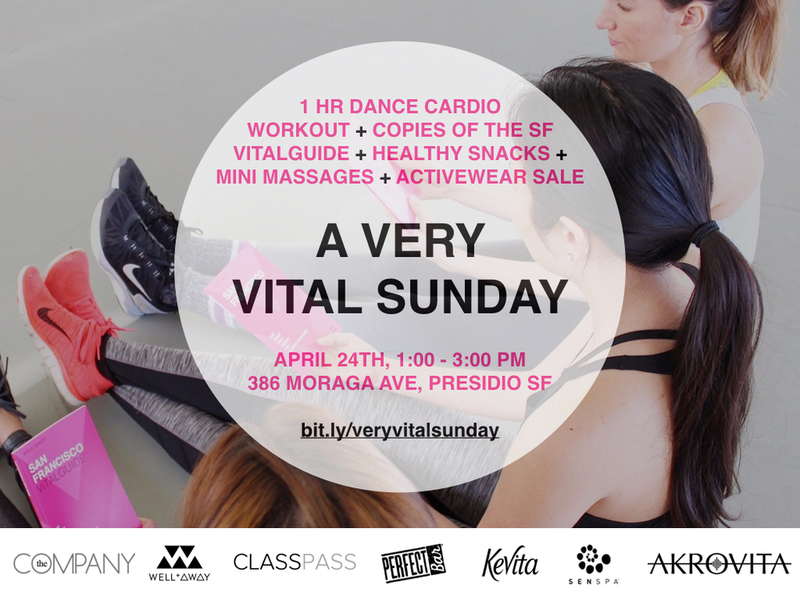 Sleep in, brunch up and get yourself over to the Presidio on Sunday, April 24 for Very Vital Sunday! This daytime dance party slash wellness afternoon with Well + Away and new dance-cardio studio the COMPANY will be the most healthy fun you've had on a Sunday afternoon. Sunday's festivities will include a signature COMPANY class, VitalGuides for all, beverages from KeVita, protein bars by Perfect Bar, a trunk show by fashion-forward local activewear company Akrovita and a few healthy surprises. Tickets are $30. 7x7 agrees with us and shared Very Vital Sunday in their weekender roundup of best ways to get your sweat on. Come join us for an afternoon workout, light bites, kombucha and mingling with new healthy friends. Grab a gal pal and snag your spot now!